In this masterclass, you’ll work with techniques of folding and edge generation to create pieces that are suitable for a variety of uses, from wearables to art objects. The workshop will start with the creation of a personal sample of a small relief-like construction, which will illustrate the methods of forming folds and edges. The special features of different areas of application, materials and sizes will then be explained. After that, students will create their own paper model for a larger item, which can be in the applied field, such as a scarf or handbag, or could have a purely artistic or decorative purpose, such as a fine art object. Andrea will be on hand to offer one-to-one guidance throughout the whole process from idea generation to realising the construction. 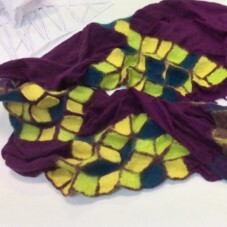 Students who have done a felt-folding workshop before may bring their handmade prefabricated pre-felt to the workshop. Please contact Andrea beforehand for conception and calculation. 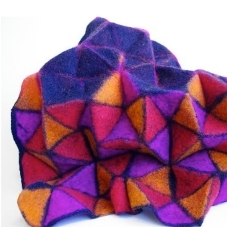 This masterclass is suitable for those with some experience of felting, but mathematical understanding is unnecessary! Andrea has engaged in artistic practice since the ‘70s, where she was particularly interest in abstract, reduced, and form-based spatial art. 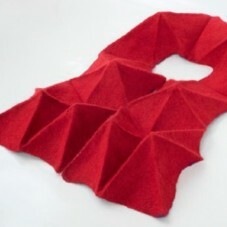 She discovered felt’s potential for spatial creation in 2004 and studied at the Felt School in Oberrot, Germany to learn more about the material. Since then, felt has been one of her favourite materials for making sculptures. The construction itself takes precedence in Andrea’s work, although the changeability and the liveliness of the finished object are also important to her.